Convicted 13.01.1876 of allowing consumption out of hours. fine 5/- plus 17/6d costs or 7 days detention. Address as Guildengate Street in 1842, 1865 & 1869. 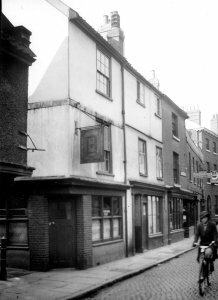 90 St Georges Street from 1904. Stood on the corner of St. Georges Street and Alms Lane. Described 17th March 1888 as the property of Charles Crawshay. On Thursday 9th February 1905 the Chief Constable objected to licence renewal owing to the back doors opening into enclosed yards common to other tenements. Destroyed by enemy action April 1942. The customs officer confirmed 01.10.1942 that the house not reopened. The name was only ``recently and finally removed from the Licensing Register'' according to a report dated 23.11.1966. House No. 387 on 1845 Magistrates list.